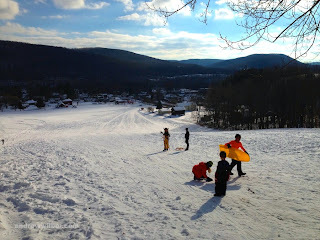 This Monday I did something I hadn't in a few years: Went sledding. Well, I may have gone sledding more recently, but certainly not at the level of yesterday. In fact, the last time I can remember such good sledding was on the exact same hill in Pine City in about the same time in January, 2009. I was about to leave for Italy then and probably remember because I was trying out the new camera I'd bought for the trip. It's hard to believe that in just a few weeks my sister Mattea and our friend Mikaela will be making the journey to the same place––Friuli Italy, that is, not Pine City. Being there looking up at the same snow covered hill that I did four years ago made me think of that, and wonder if they will have as awesome of a time as I did. I hope they do. It also made me wonder what's next for me. I doubt that four years ago I could have imagined how amazing that spring would be. Or the course of by some standards even more amazing events that it set in motion. The last nine months have me feeling like it's very unlikely my life will take a positive, world expanding turn like that again. But then, four years ago I probably felt it was just––if not even more unlikely. At any rate, it was good sledding.